Have you heard? Malaekahana is the new Pounders. Malaekahana is the area between Laie and Kahuku, with Gunstock Ranch on the mauka side and the state park on the makai side. Scot has landed there twice in the last couple of weeks. (I have a feeling he'll soon be going even further, without even trying! But that's another story.) I guess he's too humble and shy to post a story himself, or too busy editing all his great helmet cam footage, but I don't mind telling the story for him. His most recent flight was a great example of what I think of as competition-level tactical flying. He got up fairly high at the Punaluu ridge, along with visitor Laddie, and then hopped downwind across Sacred Falls to the next ridge in Hauula. But the lift wasn't working as well there. So he decided to return to the Punaluu ridge. It's not easy to do - I've tried many a time and failed. 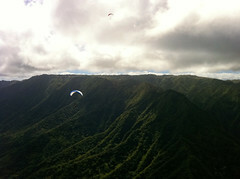 But Scot pulled off a nerve-wracking low headwind pass around the foot of the Punaluu ridge. Laddie followed right along, and they both made it back, by the skins of their teeth. Then after scratching back up from down there, this time around Scot worked the Punaluu ridge patiently, getting high above Sacred Falls. When he was well above cloudbase, at around four grand, he headed out along the back of the range. Duck and I watched him sail past us as we were folding up at Pounders. He opted to head into the wind for a convenient landing at the beach on the far side of the state park, but I bet if he'd continued along the back he would have landed at Kahuku High School! I guess we'll save that for another day. While we were flying downrange, Visitor Laddie from Alaska had continued uprange, making it almost all the way back to Kahana from Hauula. Great flying with you, Laddie! While we'd been up in the air above Kahana, I'd received a phone call from Left Foot Jim, and he'd said he was driving around the island with some beer, and would we like a retrieve from anyplace? Wow, how could we refuse that offer? Jim showed up at Pounders with his usual good spirits, and we went to find Scot at the far end of Malaekahana, and we returned to Kahana to celebrate long into the evening. Thanks Jim! You are the best. This was on the same day Dave, Jorge, Thom and Maui Doug flew downrange from Makapuu to Waiahole. Clearly a great day all around. You can see from the few pictures I took that cloudbase was high above the whole range while we were flying, which was quite a bit earlier than the Makapuu crew. Sometimes the time of day can make a big difference in the conditions. I look forward to following Scot downrange (and occasionally upwind) on many future flights. To Malaekahana - and beyond!